Pool maintenance made easy by the premier Central Arkansas pool contractor. We love the opening, maintaining, and closing pools. Would you like us to service yours? Let’s schedule an appointment today. Contact us and we will help you plan the best maintenance service for your pool. We are happy to service pools for our clients, and to provide advice and suggestions to our clients who enjoy working on their own pools. We often see members of a pool-owning family celebrate opening day, enjoy months of at-home pleasure, and grieve a little at the end of the season. If you enjoy working on your own pool, we share your enthusiasm. Maintaining your pool requires less work than lawn care, less time than kitchen chores, and is more rewarding than any other work around the house. The do-it-yourself program promotes a great understanding of how your pool works and an opportunity to open your pool on your own schedule. Even if you do opt for the “maid”–that is, our dedicated Central Arkansas team–to do the spring cleaning, reviewing the procedure will help you understand the mechanics of your pool and will give you the confidence that your pool remains healthy, safe, and clean. You needn’t worry that your pool will be an expensive headache to maintain. We’ve become the premier Central Arkansas pool contractor because we have been building pools in our community for decades. We know what pools here need, and we will share our experience with you. We’re happy to help you service your pool. Our expert technicians are always available to develop the best plan for your pool and to maintain your pool for you. Get in touch if you have any questions or would like to schedule maintenance service. Ready to learn more about how to maintain your pool? Let us share some tips we think you’ll find useful. Before you pull off your pool’s winter blanket, remove the leaves, dirt or other debris (and water, if you have a solid cover). You are working to prevent debris from falling into the pool water when you remove the cover. Since you will want to clean your pool cover before storing it for the summer season, removing debris while it is still in place gives you a head start. A portable pump can help you get rid of standing water on the cover. A plastic pail with a rope tied to the handle makes a handy bailing device. Begin adding water while you are cleaning the cover. It will save time as well as raise the cover a bit, making it easier to clean. You will need to clean the cover more thoroughly after you remove it. Consider using your driveway to spread out the cover. A pool cover spread over your lawn for just a few hours of sunshine can build up heat enough to damage your grass. Check your equipment by inspecting and cleaning all plumbing and associated equipment and replace any parts that look suspicious. Filter O-rings and gaskets should be replaced if they appear worn. If you have underwater lights, start the season with fresh bulbs. Clean and backwash your pool’s filter. Once the water has reached the proper level (mid-skimmer), restart the filter and check for leaks. Over the winter the chlorine in your pool worked hard to defend the water against algae and bacteria that developed when dirt got under your pool cover. Jump-start your swimming season with a double-shock of the water. Use twice the dose of a regular treatment with Sock-It, Super Sock-It, or HTH super shock. Make sure water is properly balanced. Chlorine should be kept between 1.0-3.0 PPM (parts per million) and pH should be between 7.2-7.8. Ideally, the filter should run twenty-four hours a day (10 to 12 hours minimum). Should the pool water become cloudy, run the filter constantly until the water clears. Remove leaves and any other debris on the water surface with your skimmer net. Brush down the walls every two weeks. While you’re lounging by the side of your pool, your automatic cleaner needs to be chasing dirt for four to five hours every other day. Keeping the pool clean helps to lower the chance of algae in the pool water. The pool needs to be shocked once a week using granular chlorine, or a bawdy joke – pools are easily shocked. Always follow label directions. Clean the skimmer and pump baskets as often as possible, particularly when leaves are falling from overhanging trees. It is important to remember to check the skimmers and baskets after a windy or rainy day. Keep an eye on the pressure gauge. When the pressure is 5 to 8 pounds per square inch above normal (or the return flow is considerably less than usual), it’s time to backwash. This should be done for one to two minutes until the water is clear, then switch to rinse for one minute. Backwashing rinses the filter sand and gets rid of residue that could be carried back into the pool. Cleaning is also important for DE or cartridge filters. Monitor the pressure gauge and clean by following the manufacturer’s directions. Remove any scum ring around the waterline by cleaning the pool walls regularly. Using a tile and vinyl cleaner every three or four weeks can greatly simplify this task. It is essential to maintain properly balanced water in your swimming pool. With some experience, you will find that this is really not a hassle, and will greatly enhance the enjoyment you’ll get out of your pool. There are a few things you should keep in mind regarding testing water and keeping an eye out for problems. Always follow test kit instructions (test strips are easier to use than liquid kits, though kits are generally more accurate than strips). Liquid reagents only have a shelf life of one year, so remember to use fresh reagents. Before using the test cell, rinse it out with pool water. Retrieve a water sample at elbow depth from the deep end of the pool. The most important poolside tests are those for free chlorine, pH, and total alkalinity. Free chlorine is the unused, effective chlorine that you want in your pool. PH is a measure of the pool’s acidity, measured on a scale of 0 to 14, with 7.5 being a perfect reading. Alkalinity measures the total alkaline materials that are dissolved in your water, and acts as a buffer to stabilize pH. Keeping your water properly balanced is the most important task in maintaining your pool. By spending time on regular maintenance tasks, you’ll greatly reduce the chances of anything going wrong. Remember, it’s always easier (not to mention less costly) to work to prevent a problem than to try to fix one after it has occurred. Two of the main issues pool owners need help troubleshooting are cloudy water and algae. For pools with cloudy water or algae, the solution is fairly simple. First, adjust the pH to 7.2-7.8. Add Algaecide 60, then shock, and then add a settling agent and a clarifier. Run the filter for one hour, then turn it off overnight. The following day, vacuum and set the multi-port valve to waste. Here are a few tips that will help you solve these problems, if they occur. Aside from making your pool look uninviting, cloudy water can also harbor contaminants and stain-makers. There are any number of things that can lead to cloudy water, and the solution is generally simple as long as you follow label directions. Contaminants build-up: Swimmer wastes and other contaminants can build up, resulting in “combined chlorine.” The solution? Shock the pool! In a bucket half-filled with water, dissolve 1 lb of calcium hypochlorite (granular chlorine) per 10 thousand gallons of pool water. Need to know how much water your pool contains? Get in touch and we’ll help you. Pour dissolved chlorine in pool and let circulate. Fill a bucket about 1/2 full of water. Add Shock. Do not stir. Let sit for a few minutes and pour only the liquid into the pool. Do not try to dissolve the residue. Water Out of Balance: A high pH, high total alkalinity, or high calcium hardness will cause cloudy water. Test the water and adjust! Low Chlorine: Test the water and adjust the chlorinator or add chlorine. High pH: Add pH Minus. Poor Filtration: During the swimming season, the filter needs to run a minimum of 10 to 12 hours a day. If the filter becomes dirty, backwash and use Filter Cleaner and Degreaser. Add 1 quart settling agent. Run the filter 1 hour; turn off overnight. When the pool is completely clear, add stain & scale preventer to remove any stains. To prevent reoccurrence, use a stain & scale preventer weekly. One of the most widespread problems pool owners seem to have is algae. Algae comes in many forms, but green and mustard algae are the most often encountered. If detected early, they can be easily treated and killed, though mustard algae often is tough to completely get rid of. Green algae is the most common type of algae bloom in pools, but the treatment is not too difficult. The first sign of green algae will be a slimy bottom. (Hey, get your mind out of the gutter!) Check for a slimy film on stairs or walls of pool. (This way you won’t have to swim to the bottom of the pool to check the liner.) The treatment is two simple steps. First, brush the entire pool (corners, steps, bottom, etc.). Then add twice the recommended amount of shock. The pool will seem to have become more cloudy, but it should clear in 12 to 24 hours. Follow all label directions on chemicals used. If the pool remains cloudy, a clarifier such as Majestic Blue or Ultra Blue may be needed. Mustard algae is another type of algae that is common to pools, but don’t break out the buns and dogs just yet. Unlike green algae, mustard or “yellow” algae does not cause a slimy liner. The first sign is a hazy or cloudy pool. Other than adding zing to your hot dog, there’s nothing pleasant to say about mustard algae. Often, with mustard algae, use of a flocculant is necessary after the algae has cleared. Follow directions on the bottle and make sure to vacuum to waste when vacuuming fine debris. Black algae, sometimes known as blue-green algae, appears in pools as sporadically scattered black splotches. This strain attaches itself to pool walls (primarily plaster) and sends roots deep into the finish. Couple that with the fact that it has a slippery, protective, gelatinous sheath that makes it highly impervious to chemical treatment, and you have a formidable foe. The black algae strain can resist most chlorine shock treatments, and holds its own against most algaecides. The best way to deal with black algae involves a combination of chemicals and elbow grease. You will have to scrape and brush hard to remove the protective sheath and leave it vulnerable to chlorine. Follow all label directions on chemicals used. Would you like help maintaining your pool? 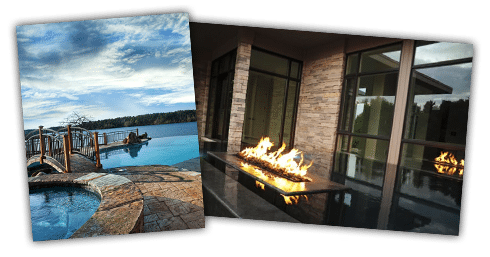 Get in touch with us, the Central Arkansas pool contractor dedicated to making sure you love your pool. Give us a call at (501) 448-2053 and our service technicians will create the best maintenance plan for your pool.